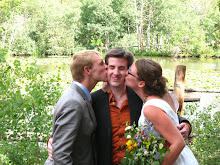 For Matt and me, there was a lot of negotiation and compromise involved with planning our wedding. For example, we wanted to stand in front of the lake to get married, but there was literally no space. We could have cleared the whole area of the trees and bushes that stood in our way, but that would have conflicted with our desire to express our eco-friendly values. Matt suggested that we stand on top of one of the picnic tables to tie the knot. I hated that idea (we were already doing everything so unconventionally!). I tried to logically point out that if we stood on one of the picnic tables to get married, we wouldn't have enough space for everyone to sit. He replied logically, "Well, then we can have people sit at the table we're standing on." That kind of back and forth ("I think we should do it this way" and "Well, I think we should do it this way.") didn't stop once we had the marriage certificate in hand. Matt and I have to make all sorts of joint decisions as we craft a life together. Now we're entering into the phase of building a house together [insert ominous music]. It's exciting, of course, but it's also nerve-wracking thinking about all the negotiation and compromise that's going to take place so that our new house reflects both of us. First point of contention: the color of our counters. 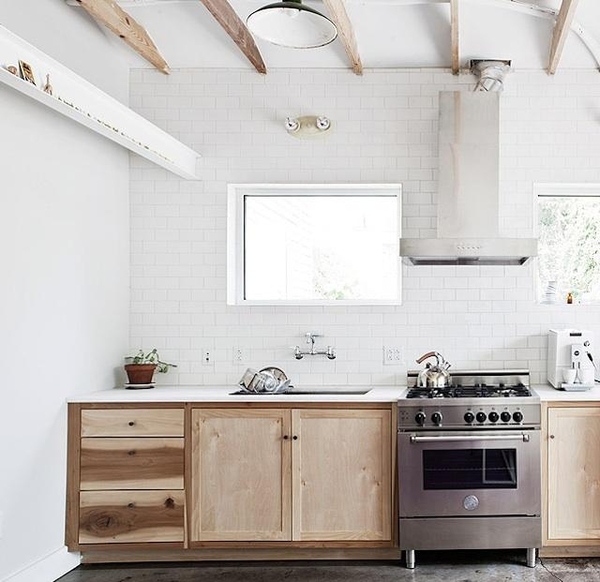 We've agreed to birch cabinets, but now we disagree about the color of the countertops. Our options are white, black, or gray. Today on Feeding the Soil: I might be pregnant! REMINDER: The last Purposeful Conception Course: Preparing Your Mind, Body, and Life for Pregnancy starts May 7. Register today! We'd love to have you join us! I recently attended the Austin Earth Day festival as a representative of the school I'm trying to start in Austin. I look forward to sharing a couple of posts to tell you all about it. First, I wanted to share with you the custom stickers I ordered from an Etsy shop called Shop Toast. They were perfect! It was easy to whip up my design, and I had a great time working with them to ensure that my stickers arrived when I needed them. I was so thankful for their willingness to donate to our event. As part of our booth, we invited children to plant lima bean seeds in eco-friendly cups. We used the stickers to label each cup. At the last minute, I also decided to use them to add a little color to our volunteer nametags. That way, I could create the effect of professional, colored nametags without actually having access to a color printer. With customized stickers, the possibilities are endless! Beyond all the fun parts of DIYing aspects of your weddings, there's also just the nitty-gritty legwork that goes into ensuring that you've thought through every last detail to make sure you have everything you need at the event and that everything runs smoothly. 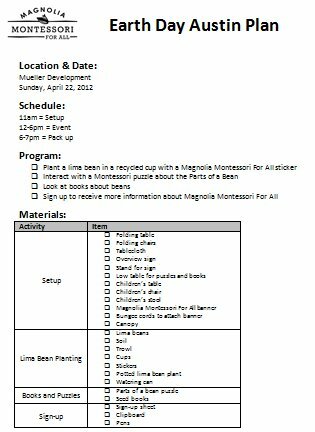 I'm reminded of this process as I prepare to attend my first community event as a representative of Magnolia Montessori For All. We'll be at the Austin Earth Day Festival this Sunday. You should stop by if you're in town! We'll be helping children plant lima bean seeds in recycled cups (labeled with stickers that have our website). We'll also have a Montessori puzzle about the parts of a seed and a book about seeds. I made a plan to ensure I thought of everything, but now I actually need to execute the plan! I made the plan by visualizing everything that would happen that day and then making a list of what we would need to have with us. The visualization process also helped me generate a few more action items related to my list, such as e-mailing volunteers instructions to make sure they're on the same page. There's lots to do, but I need to stay focused on taking it one step at a time so I don't get stressed. Today on Feeding the Soil: Crime and such. Woo-hoo! 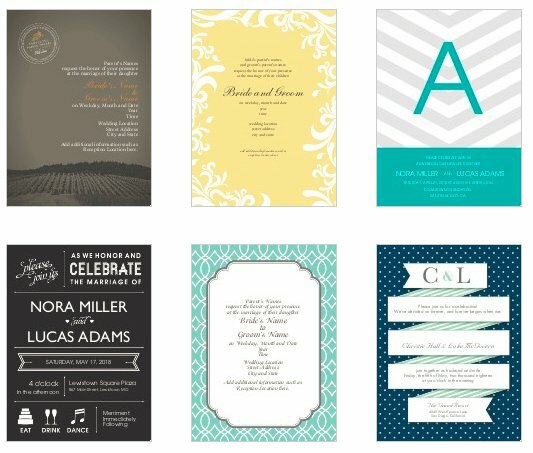 So excited to announce this week's opportunity to win $500 worth of customized wedding stationery from 123Print.com. You could use your gift certificate to order wedding invitations, wedding programs, RSVP cards, and other items for engagement parties, bridal showers, etc. You can use one of their templates or upload your own design. This site would have been perfect for printing Henry's birthday party invitations. Leave your first name and first two letters of your last name in the comments section. Enter by Sunday, April 22 at 11:59pm. US residents only, please (my apologies!). One entry per person (but feel free to send your partner over to enter!). 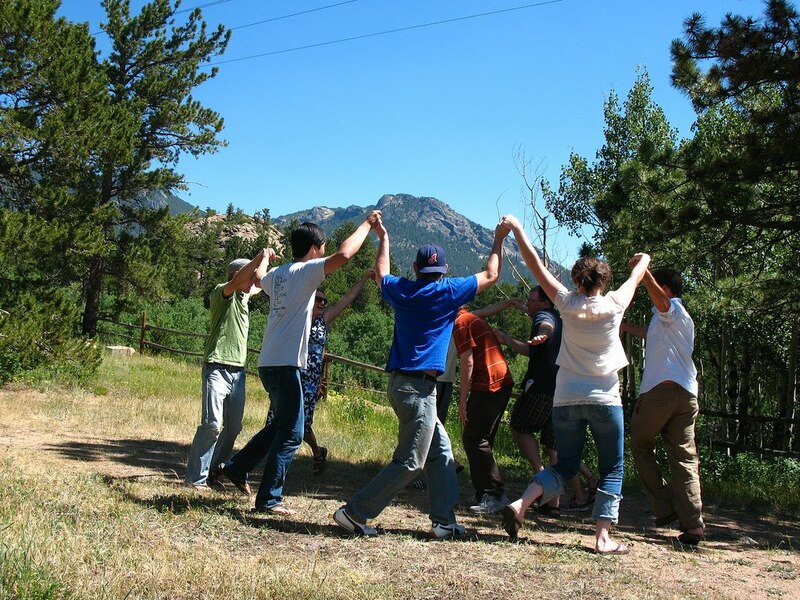 Today on Feeding the Soil: More updates on building a community. 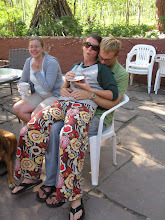 Planning our wedding wasn't just about putting together an awesome party with our nearest and dearest. It wasn't just about commemorating and celebrating our lifetime commitment to one another. At an even more profound level, it was about proving to ourselves that we could come up with our own authentic vision for our lives and make that vision happen for ourselves. That process of digging deep and unearthing what is most authentic to who we are is at the core of living a meaningful life. The art of collaborating with another person to align your authentic visions into a coherent life path is at the core of maximizing the fullest potential of marriage. Matt and I recently moved our family to Austin because we're taking steps toward making our vision a reality. We wanted to live in a place that had more nature. Now we take advantage of weekend hikes with our son Henry and our bloodhound Hoss. We also wanted to live in a place where I could work toward starting a public Montessori school. And so I'm doing it! I'm working to create Austin's first public Montessori school. And now we're working on the next piece of our trajectory: figuring out where we want to settle and build community. Initially, I had big dreams of building a little pocket neighborhood on two acres of land, but that vision is shifting, partly because I'm realizing that certain priorities matter more (such as feeling safe and living closer to the city center) and because our timeline is more urgent. We want to buy or build a home sooner rather than later. I find that the process of identifying your most authentic path is a difficult one. Sometimes I think I want something but really it's just something that the ideal version of myself would want. Does that make sense? It's a difficult concept to explain. I think I'm less at risk for doing what others think I should do and more at risk for doing something because I think it's what I want to do (but it's really not). For example, I could totally see myself buying a farm because the ideal version of myself would love to live on a farm and take care of it. But in reality, that's not who I am. I would rather spend my free time on the computer or at the sewing machine. So I have to separate out who I really am versus who I wish I were. One strategy I've been using to identify my authentic path with regard to building a community and a home has been to take baby steps in a certain direction and see how they feel. I'm looking for something that we can get really excited about. We may have found it. We found a 1/2 acre that backs up to a creek bed in a pretty safe neighborhood near where I want to start the school. I'm partly sad that we won't be surrounding ourselves with people who intentionally want community, but I'm pretty convinced that we can seek out connection within the neighborhood. We could use the front area for a small garden (with small being the operative word, if I'm being honest with myself). But do you know what I really want? A pool! I hate to say it, but it's true. I think pools are hugely irresponsible (environmentally and financially), but I can't get over the fact that I think it would greatly contribute to our quality of life while we raise a family in a place that is swim-ready six months out of twelve. I just have visions of Henry and his friends swimming in our pool all summer long. We can sit out there and read/work on the computer, or we can watch from inside the house. That's pretty much how I spent every summer visiting my grandparents and aunt in Florida as a child, and I would love to provide the same opportunity for Henry. A small garden. A light-filled house. Windows that open to trees. A pool. A large fenced-in area for our chickens and Hoss. A cul-de-sac for Henry to learn how to ride a bike. A neighborhood association to join. Solar panels to work toward net zero. Composting. Walks to the park. Working nearby. I think it's a vision we could get really excited about creating together. Today on Feeding the Soil: Updates about Henry's Montessori floor bed. I swear this picture does not do this craft justice. You see, Matt, Henry, and I were on our way to visit some new friends (whom we met via this blog!). 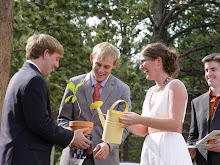 When they came to our house for dinner, they came bearing a tomato plant (awesomeness!). 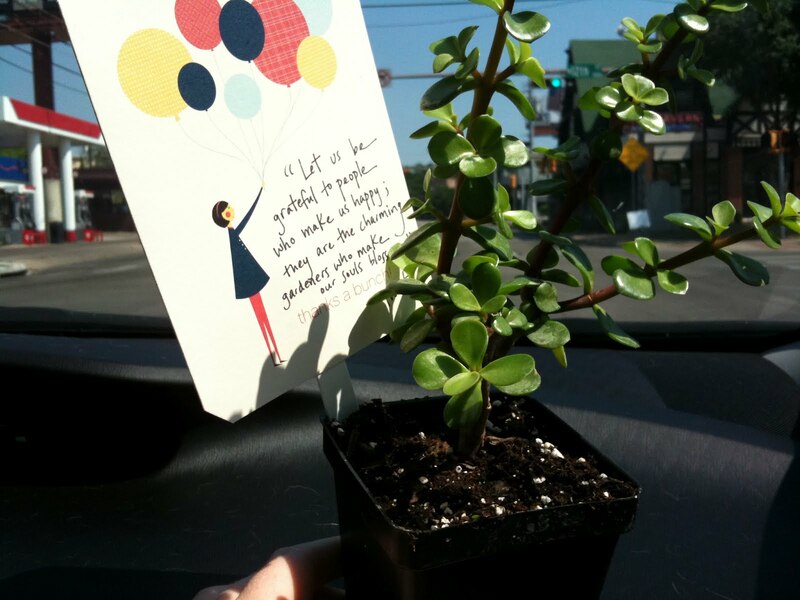 We decided to return the favor by getting them a little succulent. To cute-ify the plant, I took a thank you card, sprayed some adhesive on both sides of the inside, and folded it shut over a garden stick. I clipped the corners diagonally with scissors, wrote a quote on the front and a note on the back, and voila! We were running late, so I sprinted into Whole Foods and grabbed the first good looking succulent I could find (which happened to cost only $2.50). I tried to take a picture of the craft in the car (for your viewing enjoyment) but quickly realized that my good camera (a Nikon D60) didn't have its SD card. So I had to iPhone it. Sorry about that. This craft would look much better if: 1) you saw it in real life 2) you used a smaller thank you card 3) you planted it in a cute pot or covered the plastic pot with some fabric and ribbon 4) took a picture of it using a camera that blurred the background if you're trying to photograph it in a moving car. 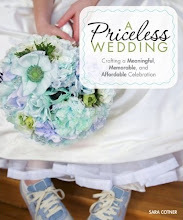 It would make such an easier centerpiece (keep them on the smaller side so your guests can chat across the table) or gift for someone who helped to make your wedding happen. Today on Feeding the Soil: Updates about our plans to build a community in Austin.